1. I introduce the program opportunity to the 5th grade students during one of my lessons. I tell them that we will be having a program where 2 students per 5th grade homeroom will be selected by their peers. I explain that this is a program where 5th graders will be helping younger students with sight words, math facts, and morning work in the first 15 minutes of each day. They vote anonymously for 2 kids in their class and the top 2 are the Peer Helpers. The kids get super excited about this leadership opportunity. 2. I announce the selected Peer Helpers on the intercom during announcements and send home a congrats letter to their parents (which also serves as a permission slip). I schedule a training session for the 5th graders. Here is the Training agenda and worksheet I have used in the past. We review helping skills, expectations, and do some leadership building activities. The kids also sign a Peer Helper Contract agreeing to uphold the responsibilities of a school role model. 3. I email teachers in grades 1 and 2 to see if they’d like a 5th grade pe er helper to come help. 5. The students love to get their lanyards/name tags to wear. 6. The program is the 5th grader’s responsibility once I assign them to the younger grade classes. 7. 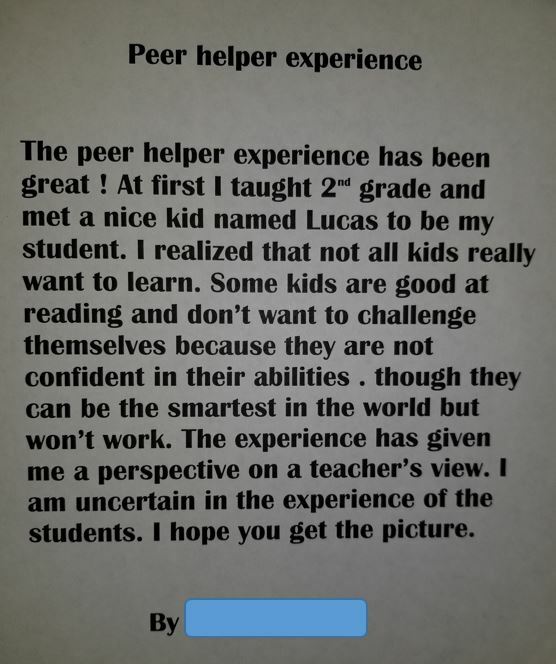 We get together mid-way through the year and I have kids share what they have enjoyed, give feedback, and they also write reflections of what they learn from being a peer helper. Each year I do something a little different with this group… but the format above is how the program typically runs. Contact me if you have any questions. Next → Next post: What is your ONE WORD?